Shuster proposes increasing federal motor fuel taxes on gasoline and diesel by 15 and 20 cents, respectively, then indexing those taxes for inflation. His plan would also add “new levies” on electric vehicles and bicycles – a 10 percent fee on the wholesale price of electric vehicle batteries and a 10 percent user fee on the wholesale price of adult bicycle tires – as well as reinstate the 4.3 cent per gallon fuel tax on diesel fuel (indexed to inflation) used by passenger trains eligible for funding under certain federal public transportation programs. Yet recent commentary by several state department of transportation executives and other industry experts indicate that any such federal fuel tax increases may be coming too late to effectively shore up the HTF. 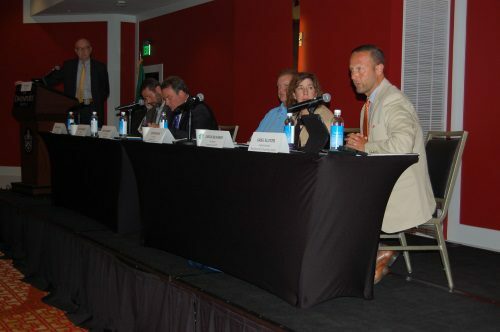 “We’re in agreement that the gas tax at the federal level is in need of CPR – it’s been kept alive, barely, but it’s not meeting the [transportation] system’s needs,” noted Pete Rahn, transportation secretary and Maryland Transportation Authority chairman, during a panel discussion (seen below) held July 18 at the American Association of State Highway and Transportation Officials 2018 Joint Policy Committee meeting in Spokane, Washington. To that end, Sen. Tom Carper, D-Delaware (seen below), who is the ranking member on the Senate’s Environment and Public Works Committee, believes that replacing the current federal fuel tax with a vehicle miles traveled/road user charge is the best funding solution going forward for the HTF. Doug Holtz-Eakin, president of the American Action Forum policy group and one of the witnesses testifying at that hearing, vouched for the VMT approach to highway funding. “I am a big supporter of that switch – in the end, the damage to roadways comes from weight, axles, and miles driven,” he said during the question and answer portion of the hearing.